Last night, I was privileged to attend Writer’s Harvest 2012, an event at University of South Florida. People paid $5 at the door, or brought three canned goods to help feed the hungry. 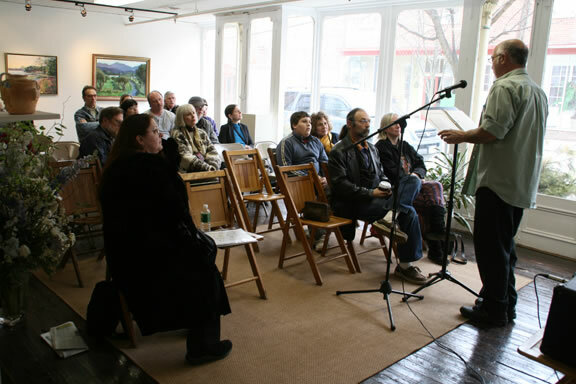 In exchange, listeners and participants got to hear readings from the likes of Jeff Parker and poet Traci Brimhall. The hall where the event was being held was standing-room only. Of course, this was in Tampa, where the literary arts have a pretty loyal following. In smaller towns like mine, poetry readings are generally greeted by a handful of patrons who feel an “obligation” to support writing and culture in general. That being said, these “few but proud” gatherings have their own unique benefits. For one, small gatherings allow greater intimacy with the work presented. The poet can speak about the writing and be understood well, and usually, the readings are far more personal. Addressing a hall full of 500 people might be a rush, but it loses some of its closeness. Both the work and the artist are “drowned out” somewhat by the environment. Comparing venues and styles of presentation caused me to think a little about the up-and-comers (like yours truly) who have to fight for their space in the limelight. Library and coffeehouse readings are great, and having a loyal little flock appreciate your work is nice. But at the end of the day, making the small time is exactly that — small. We poets are not unlike aspiring country crooners: Like them, we have to “pay our dues” in the dives and the honky-tonks of literature — the shabby cafes and tiny conference rooms where a handfull of people can begin to spread the word. There are no backlit marquees or laser-printed fliers proclaiming the greatness of the small-town writer. This is why so many scribblers migrate to locales like New York City, where, with any luck, one’s work can be heard and experienced by larger crowds and potential game-changers for one’s writing career. However, throwing fate to a place populated by similar dreamers and doers has its own hazards. All of the old “fish bowl” cliches have some element of truth; one can be a big fish in a small pond or a smaller fish in a larger pond. It depends on your desires. Personally, I would prefer not to be a fish at all. I write because I like to, I read because I love the music of language, and I appreciate people who appreciate my work. Whether that’s a crowd of 5 or 5,000, I’m simply happy to be the attended voice. Yes, I’d like one day to move beyond “the small time,” but for now, with my situation in life, I’ll take the sporadic applause of a few over the ovations of masses. There’s time for both yet.